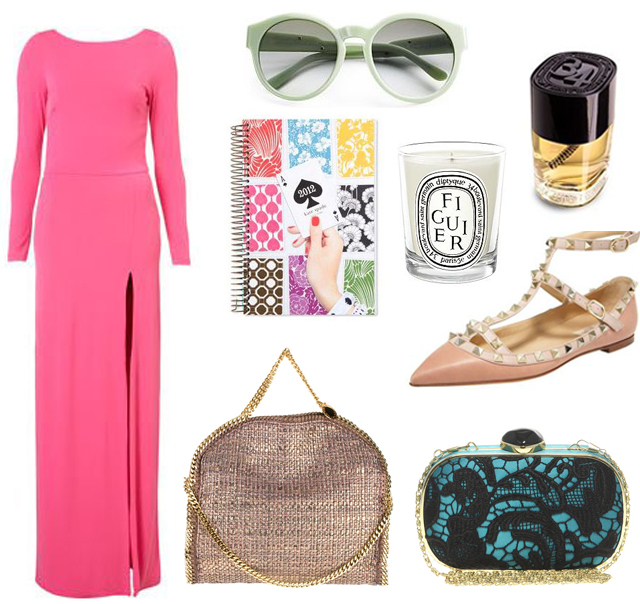 As expected my current wish list if full of whimsical and feminine pieces--lots of pink, lace, and shimmer (I took inspiration from here). I'm a sucker for anything by Stella McCartney and her green sunnies and woven handbag are calling my name. I've been eyeing Valentino's Rockstud collection and I'm partial to the flats (perfect for all the holiday parties). I also fell in love with Diptyque's 34 Boulevard Saint German perfume after taking a sample home. At first I felt it was too powerful but after awhile it really develops beautifully. Those bags are fantastic!! I love the colors and textures. i want those flats too! so amazing! Oh yes, I adore those valentino flats! great whislist! Amazing dress, sunnies and flats! !NIce post! I love that dress & the planner book! what a great list, I think I now want things I never knew I did!! haha! So cute -- I love the Kate Spade planner! What a fun Maxi dress! I love the drama of the slit and the long sleeves. I've been looking for cute stationary and planners since I started my new job and the Kate Spade 2012 planner just might take the cake! Those studded shoes need to appear in my closet like nowish. Love. Those studded flats are seriously hot. Love! love everything, the dress is my fave!! Love it all! Especially the Valentino flats... they are absolutely devine!! Lusting over the Stella McC bag, such a lovely twist from the black leather one! those wrap flats are amazing!! The clutch is fabulous. This is a sophisticated list. Those flats are fun and fancy! Ooh any of these would be amazing to give and get! I have loved those flats forever, they are the perfect ladylike with an edge shoe. Me too on the valentino flats! Everyone has been including that Kate Spade diary in their gift guides - I really want it! LOVE this list; so fabulous! Thank you for sharing. Happy Holidays! That Topshop dress looks like nothing special in the photo but when you wear it in a later post - YOWzers. Such a great look!